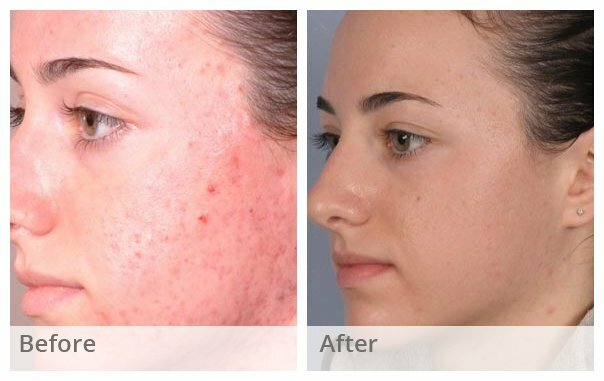 Acne chemical peel is a treatment in which a chemical solution is applied to skin to remove damaged outer layers of the skin. These acids chemically exfoliate the top layers of skin. As the treated skin comes off, fresh new skin layer with improved tone, texture, and color replaces it. This exfoliation caused by the acne-skin peel eliminates or reduces the appearance of acne blemishes and scars. It is also used as an effective treatment for facial blemishes, wrinkles, and uneven skin pigmentation. (i)Alphahydroxy Acid (AHA) or Glycolic Acid Peels: AHA peels are the lightest and gentlest. (ii) Trichloroacetic Acid (TCA) Peels: TCA peels are a bit stronger. (iii) Phenol Peels: Phenol peels are the strongest. Each type of peel has advantages and disadvantages. Who Can Use Chemical Peels For Acne? The best candidates for acne chemical peel treatments are people with superficial acne or acne scars. People with severe or very active acne may not be good candidates for acne chemical peels. Women who are pregnant or breastfeeding should avoid using a chemical peel to treat acne. Are Chemical Peels Effective In Treating Acne? Chemical peels are effective ways to treat acne. It is ok to use a peel when you have active acne. However, it is recommended that you consult an experienced dermatologist and get a prescription strength medication for your acne. Different types of peels can help with acne and acne scaring. For overall improvement of acne and mild scarring, glycolic acid peels at 20-70% can be used. For acne that is comedomal (white heads, blackheads, congested skin), we suggest use of sal. acid peels (18-23%). Sal acid is a beta hydroxy acid type and acts anti-inflammatory, even 23% sal acid is quite safe in darker skin types. Chemical peels are a good treatment for active acne, and a good product to supplement the chemical peels at home would be Retin-A, which is a night time product that helps in cell turn over and exfoliation. Note: Research studies have found about 45-50% reduction in acne lesions after a series of 4-6 peels. Most study participants have reported a “fair” to “good” result. Results tend to last for 1-2 months, with acne starting to repeat itself at this time. (i) However, we strongly recommend letting a dermatologist to have a look at your skin to find out what treatment or which peel will work best on your skin type and its prevailing conditions. (ii) A thing to remember is never to pick at the skin as the pimples are drying up, because that can leave scarring. (i) The common side effect is a sun burnt look with obvious peeling of the skin in the days after using a peel first time. This redness and peeling tends to be less noticeable with each subsequent peel. (ii) Temporary darkening of the skin may also occur, and some people with darker skin may experience skin lightening which can be permanent. (iii) As individuals with darker skin and individuals who are prone to keloid scarring are more likely to experience side effects from chemical peels, it is recommended that individuals with darker skin consult a qualified dermatologist before using chemical peels. Caution: As chemical peels function is to peel away the top layers of skin, it becomes much more sensitive to sunlight and UV rays. Make sure to keep your skin out of the sun after a peel and to use an effective SPF product. Conclusion: Majority of chemical peels seems to assist clear most types of acne. However, the dermatological community’s opinion is that other medications and treatments should be used in combination with peels to attain a satisfactory level of clearance.